Because of a comment that I made on a political meme that I shared, I have been suspended from posting on Facebook for 30 days. 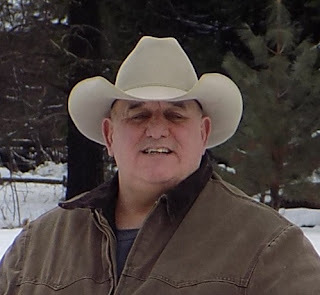 While I'm fine with Facebook's decision on my personal timeline, I don't agree with Facebook suspending me from posting history and other educational material on my American Cowboy Chronicles' wall. But since now I have 30 days off from Facebook, I'm planning a number of things to take up my time. For example, I'm thinking of training for a shot at Mount Everest, maybe going on a cruise to the Panama Canal, or maybe go up to Wyoming and visit with friends and take in a rodeo or two. Maybe I'll go out to Arizona and visit my brother, or take a trip back home to Hawaii and visit my Uncle Herbert. Maybe get more work in on my BLM Mustang, and get her to the point of being handled easier. Maybe get in more Cowboy Action shooting. Then again, I could go up to Twin Falls, Idaho, and visit my nephew. From there I could go up to Yellowstone. I've always loved Yellowstone. Of course, from there I could go visit a friend or two in Texas. You know them, they're your friends who always say to drop in when I'm "in the neighborhood" while knowing full well you live in another state. Yes, being suspended from Facebook for 30 days actually gives me a number of options. I can get away from this damn computer more. I can actually go and talk with friend face to face, hear every inflection in their voices and take note of every expression on their faces. Yes, the inflections and expressions are what speaks volumes that one can't get when talking over the phone or when "chatting" on Facebook. My confession is that I've used Facebook to fight the Fake News, the horrible slander from the Left, the hate for America by those ungrateful Liberals out there who have had everything handed to them. Like many others, I've voiced my anger at the refugee, economic, and social problems created by the Obama administration during the last eight years. I voiced my disdain at Democrats who put the concerns for their party ahead of the concerns and needs of our nation. And yes, as for my blog, I've used Facebook to distribute my articles in an effort to get real factually correct information out to people. Yes. all while loosing a lot of sleep in the process. So there you have it. Here you go! During the next 30 days of being suspended from Facebook, I'm going to get more sleep for a while. I'm leaving the good fight up to those who I know are also voicing their anger at the problems created by the Obama administration. Who are also voicing their disdain at Democrats who demonstrate no love for America. Realistically, I know that I was just one little voice among the many out there who are raising up. And though I'm suspended right now, I know I will be back. And with that, I want to say good night to my Facebook friends. See you in 30 days. And until we meet again, stay vigilant.